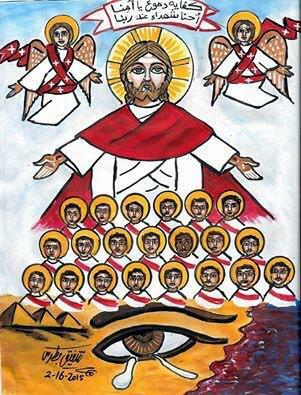 The calendar for the Church in South Africa commemorates the martyrs of Africa on February 20th. Africa is a large, culturally and ethnically diverse continent. According to tradition, the Evangelist St Mark brought the Gospel to Africa and established a church in Alexandria as its first bishop or patriarch. Mark was also martyred for the faith in 74AD. The Gospel spread south through Egypt, the Sudan and to Ethiopia, and moved westward toward the ancient city of Carthage and throughout northern Africa then ruled by the Romans. The great bishop of Carthage, St Cyprian, suffered persecution and was martyred for the faith in 258AD under the Emperor Valerian. The early church in North Africa also produced some of the earliest theological writings in Latin; and St Augustine, Bishop of Hippo in North Africa, is one of the greatest Latin doctors of the Church. Sadly, many of these early Christian churches declined or disappeared altogether with the rise of Islam and the persecution that accompanied it. In the eighteenth century efforts began to reintroduce the faith of Christ to the continent, particularly in Sub-Saharan Africa. Here the obstacles were the indigenous pagan religions. Native-born Bernard Mizeki from East Africa preached the faith in what is now southern Zimbabwe. Mizeki ran afoul of the local witchdoctors, who blamed the famine then plaguing the area on the spread of Christianity. Mizeki was attacked and died of his wounds in on June 18, 1896. Missionaries and converts alike suffered for the faith in many parts of Africa in the nineteenth and early twentieth centuries, most notably in Uganda. Nevertheless, the Gospel spread throughout Sub-Saharan Africa; and it is now the largest faith on the continent; and the Church continues to grow. It is projected that by 2050 Christianity will have 1.1 billion adherents, nearly twice the number of Muslims. As the Church in Europe and North America declines in terms of numbers and influence, the Church in Africa continues to grow. The Anglican Catholic Church now has several dioceses in Africa; and it is to be hoped, and indeed expected, that growth will continue. But with success has come renewed and increasing persecution of Christians. In the 1970s, Ugandan dictator Idi Amin, an adherent of the minority faith of Islam, oversaw the deaths of thousands of Ugandan Christians, including Anglican Archbishop Janani Luwum. With the rise of radical Islam, persecution of Christians in Africa has increased dramatically in the last several years. While the news tends to focus on the plight of Christians in Iraq and Syria, the situation in Africa if anything is much worse. Topping the list of Christians confirmed to have been killed for faith-related reasons were Nigeria at 2,484 and Central African Republic at 1,088. More than 270 Nigerian schoolgirls were abducted and enslaved by the Islamic group, Boko Haram. Twenty-one Egyptian Coptic Christian men were beheaded in Libya while looking for work to support their families because they are discriminated against in Egypt. 147 Christians were singled out and executed on the campus of the University of Garissa in Kenya. As we commemorate the martyrs of Africa from the days of the Apostles to our own, let us pray for the all faithful in Africa who continue to suffer for the Name of Jesus Christ.